It's been a busy day for the folks at Motorola Canada as they have officially unveiled the Motorola Atrix HD LTE which is headed exclusively to Bell and the RAZR V which is headed to multiple carriers and stores. The Atrix HD LTE is the a followup to Bell's original Atrix (or second follow up as the Atrix 2 was never released in Canada), while the RAZR V is a spinoff on the flagship RAZR device that was launched on Rogers a few months back. More info after the break. The Atrix HD LTE is powered by a 1.5GHz dual-core processor, 4G LTE and 1GB of RAM. It has a 4.5-inch 720p HD "ColourBoost" Screen, 8MP camera /w 1080p recording capabilities, as well a microSD card slot and Android 4.0 Ice Cream Sandwich. It will be hitting Bell "this summer". The RAZR V is powered by a 1.2Ghz dual-core processor and 1GB of RAM. It has a 4.3-inch qHD "ColourBoost" Screen, 8MP camera /w 1080p recording capabilities, as well a microSD card slot and Android 4.0 Ice Cream Sandwich. 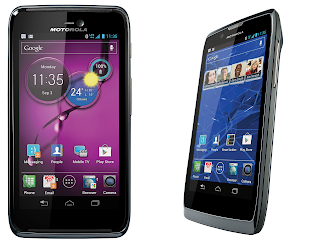 The specs seem very reminicent of the Motorola RAZR availble from Rogers and Fido. It will be hitting Bell, Videotron, Virgin Mobile, WIND Mobile and retailers including Best Buy, Future Shop, Tbooth Wireless, The Mobile Shop, The Source and WIRELESSWAVE.